Here's a Big Idea piece about the book that I wrote for John Scalzi's blog. I did an AMA on Reddit's /r/books forum—lots more stuff here! Here's a review on Tor.com. And here's the copy editor's account of working on the book. Enjoyed the background reading via the above links: they added to my understanding of your work and the publishing business. Haven't read AS yet, but plan to do so soon. A question/comment: LF has been examining different aspects/dimensions of law/order/fairness/happiness via the players. Although all LF members could be considered having been victims at some point (pre-recruitment) - what/who are the victims of last resort? Just wondering whether there's a victim pecking order in the same way that there's a hierarchy/segmentation (start-end point) in everything else human. Who would be last to fall and why? I really liked listening to the audiobooks so far, but I won't be able to hold off on reading it for too long. Partway through the book, quite enjoying the new voice, a different perspective from Bob. I'd have to echo a previous commenter saying it seems odd the supernatural is being absorbed with such equanimity. I would think there would be more jumping up and down. Then again, if NASA announced tomorrow there is incontrovertible proof of life on Mars, what would change? As scifi geeks who are preoccupied with this stuff we're tempted to say "Why, everything!" But I'd have to say not much, really, not in everyday life. Concerning your prior point about the dizzying expansion of our appreciation of the scale of the cosmos, that's the sort of thing that boggles the philosophers but doesn't matter much to the common man. He's still got to get up in the morning, put in his 9 to 5 at a job he dislikes, comes home and watches telly. If he were to encounter Romero-style reanimated corpses that would pretty much upend everything we know about biology, chemistry and physics and all he'd be concerned about is not getting his face chewed off. I'd have to admit, rewriting textbooks would be a low-priority item during a zombie apocalypse. My gut tells me there should be more of a freak-out concerning superpowers and the shattering of worldviews but I can't say I'm right. Audible have the rights but they don't tell me until they publish. Note this is seen from Mo's perspective. And Mo is in the throes of a (deepening) nervous breakdown for the entire book. Ooh, it's out in the UK! Last I saw was post 2 days ago for "It's US publication day". Can I get this got as as an e-book from anywhere that doesn't involve Amazon DRM? Then I am reading through the AMA and saw the bit about "officemate who yowls and bites my ankles" and thought "Well that seems a bit odd behavior for the missus--oh wait he probably meant the cat." Overall, quite enjoyed it. Lots of hooks for future novels, glad she's rid of it. But. Bob, wtf. "I really need to talk to someone about applied containment theory. When I get time"?!?! Yes, I get it, but damn it, that's your WIFE. GRRRRRRR. Also, that ending so much didn't wrap up as end. Granted, the Laundry books tend to do that, but this felt a little _too_ abrupt. Anyhow, ready for two-from-now. I think Alex would be interesting, but I've found I'm actually somewhat invested in their (Bob & Mo's) lives. I really do care and want to know how their marriage will handle this. A bit of epilogue would've been nice. I expect I'll finally manage to get hold of a copy some time this month. is why you are a selling & popular writer I I won't ever be. I can ( & have ) write 10 000 word dissertations & papers, but that turn of written phrase is what makes the difference. You cant avoid the DRM in general but its also on the Kobo and Nook stores as an ebook, depending which side of the pond you live. We will get back to Bob in book 8. I'm just taking some time to flesh out the world. Just went out to Barnes & Noble to find that they didn't have "The Annihilation Score", at all, but they could order it for me. I said no thanks, I can do that online, which I'll do in a few minutes. Guess it'll be a while before it's safe for me to wander into the spoiler thread, and I have more time to finish off what I'm reading. Didn't think to ask if they could check the south store, but wasn't about to go down there today. It doesn't help that, as I discovered last week, they've been futzing with their website, and not only did they lose everything I had saved for future orders, they removed the ability to check the stock of the local stores. I'll order from them and get a discount, which I don't mind, but won't be contributing as much to the Feline Feeding Fund. Sorry Menhit. So, I went around the corner and got the box set of "Cowboy Bebop", and came back to where I'm house sitting. Which I can connect to The Laundry. Just over the hill, behind the houses I'm looking after* is Meadow Lake Airport which, IIRC, is mentioned in "The Apocalypse Codex", though Charlie puts it closer to Denver. Last night there was a hell of a hail storm, not Fimbulwinter, but unpleasant. *Yes houses. Bad timing I guess, was already looking after the house, dogs and cat of some friends when their neighbors (who I somehow got wrangled into house sitting for) decided they would go on a trip too. They have dogs, a cat, and chickens & turkeys. Yippee. Just looked in the iBooks store, that illegal "Accelerando" is still listed, but "Scratch Monkey" from the same 'publisher' is gone. And there's the modern world in a nutshell. Your burger also took a year to finish, and it lasted even less. With care, most cocoa trees begin to yield pods at peak production levels by the fifth year, which can continue for another 10 years. Ripe pods may be found on cocoa trees at any time, however, most countries have 2 periods of time per year of peak production. A farmer can expect 20 - 50 beans per pod, depending on the variety. The difference between SF authors and chocolate is fungibility; one SF author -- or even one harvest of produce from one author -- is not substitutable for another. But unlike chocolate you can consume good books over and over again. And they're often better the second time around. "But. Bob, wtf. "I really need to talk to someone about applied containment theory. When I get time"?!?! Yes, I get it, but damn it, that's your WIFE. GRRRRRRR." one SF author -- or even one harvest of produce from one author -- is not substitutable for another. (Note: it's a comment about how host is not the mass produced version, but hey). Just parse under: imagination and creativity aren't economic goods, despite what Disney says. Can't monetize unique capabilities and all that. Meta: Reddit culled Pao. Not surprised, but glad you messaged a mod. (*boom tish*). "Just went out to Barnes & Noble to find that they didn't have "The Annihilation Score", at all, but they could order it for me." Annihilation Score is not referenced in Strand NYC database yet. Some trucks got lost on their way to NYC ? Boo the audio delay. I have an audible account and just got a free credit. So instead I bought the ebook, which was cheaper. I loved the use of the British Library as a setting. 1. Did you visit the B.L. for research? 2. Have you visited the archives there? 3. With your mention of unique manuscripts, have you considered donating / selling your own manuscripts to a National Library such as the B.L. or N.L.S.? But publishers have to mostly treat books as if they're replaceable. They can't tell ahead of time what will sell and what won't. So they cast them into the world like an ancient farmer sowing his seed. Some of it will be eaten by birds, some of it falls on stony ground and fails, but enough of it thrives to get a decent harvest. If Gaiman gets hit by a beer truck and dies, the publisher has to go on without him. There isn't another Gaiman, but there's somebody else who can be as successful as him, and since there's room for only so many successful writers, that somebody gets his chance because Gaiman is gone. This may be particularly true for romance writing. If each line has strict guidelines about characters, plot, etc, the books are not that far from interchangeable. And if a writer can add a special touch so that readers particularly value her work, and it leads her to ask for double the advance, will the publisher consider that a good thing or not? It would not surprise me if romance publishers start creating their own author names, and writers who are good enough at matching the style of the company-owned author get to sell books to be published under that name. It could get to the point that writers can sell individual chapters. After all, in manufacturing we got interchangeable parts produced by craftsmen before we got them produced by machines. When Heinlein died, there could be no more Heinlein novels. But if Heinlein had been owned by the publisher, and writers who could provide material to fit the Heinlein target audience did work-for-hire, the Heinlein brand could continue as long as it was profitable. It would not surprise me if romance publishers start creating their own author names, and writers who are good enough at matching the style of the company-owned author get to sell books to be published under that name. See House Name, an old practice with the pulp magazines. Yes, the brand could continue, but, unless the stand-in authors are as good as the original, the brand will quickly be trashed and become unprofitable. 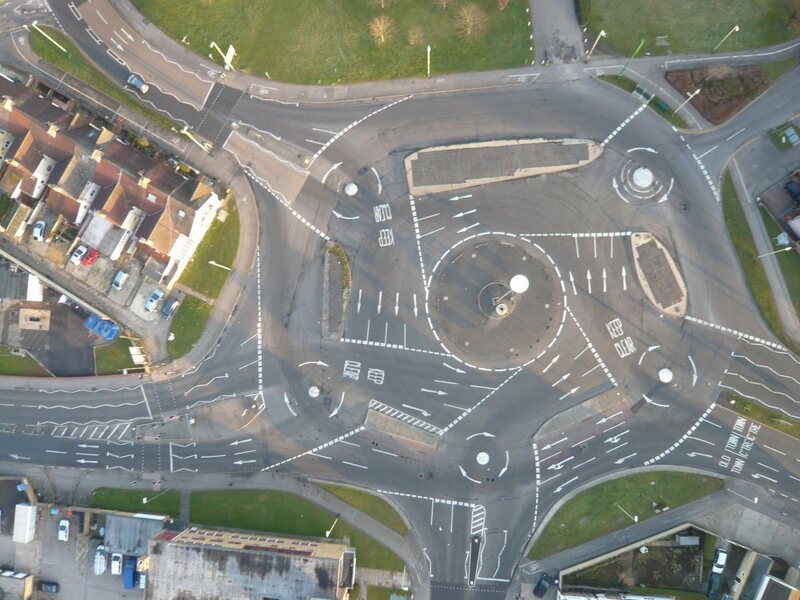 Roundabout made of roundabouts in Swindon - or something far more sinister? Ah yes, the Swindon Magic Roundabout. Sweetly restrained compared to the Hemel Hempstead one. My wife lived in Swindon lo these *8&(*%^ years ago, when its one was new. Swindon being in Wiltshire, where much of the British Army (and particularly its armoured corps) has long been based, it frequently had Army convoys go through. On one occasion, shortly after that construction was completed, an armoured car column was observed approaching it. The commanding officer arrived at the MR, and paused to consider it, and the best way of transiting. After a few moments, the arm went down, and the entire column went straight across, ignoring all the paintwork and signs. No, I have no idea whether there is any truth in this story, but it's rather fun. Off topic, a couple hours ago I write a comment in the latest thread about how my hotel blocked all of the comments in the 2nd-to-last thread, because they claimed there was a copyright violation there. The software used to do the censorship was called Smoothwall. Now the thread that I made the comment in has also been blocked for copyright infringement or piracy. I'll see whether they block this one too. Maybe they consider it copyright infringement whenever someone mentions their name. Or possibly by coincidence somebody in the last 8 comments did something they considered piracy. I first ran into the Hemel Hempstead magic roundabout when I took a wrong turning off the A(1)M in heavy rain, at night. Surface water obscured the road markings, and in any case I was functionally night-blind in one eye which made reading the signeage next to impossible (at night travelling at highway speeds); I mistook it for a regular two-lane roundabout and went round at least three of the mini-roundabouts on the wrong side of the road before the oncoming headlights and horns clued me in. That was back in 1990. I still have vivid flashbacks. This one isn't blocked for me yet so it takes more than just the name Smoothwall to get a page blocked. I won't know anything about what did it until I get some other kind of access, since all I have from my own post is from memory, and I haven't seen any of the others. I don't want to experiment at random, and it's only curiousity that makes me want to know what they're doing. If you'd got as far as Hemel, past the M1, then I assume you'd given up on your original route and were cutting across country. It makes sense, I've tried that myself when the M25 has become an 8 lane carpark. In which case, yeowch! The Magic Roundabout is okay if you've met it before, or if you're with someone who knows it (which was the case for me - when I met my wife, her place of work was an office building on the road that leads downhill to it). But dark, wet and lost? You don't get on with Herts, do you? No, I was driving to Hertford, not Watford, at the time. No, I don't get on with Herts., even though I lived there for about a year. For us it's now 13 years. On the other hand where our house is built used to be, when my Grandmother was a toddler anyway, about 100 metres into Cambridgeshire. We occasionally wander into London and then wonder how we lasted there as long as we did. This page contains a single entry by Charlie Stross published on July 9, 2015 12:56 PM. That "Annihilation Score" spoiler thread you're all asking for was the previous entry in this blog. Any Sufficiently Advanced Technology Is Indistinguishable From Cthulhu is the next entry in this blog.